For the treatment of fine, superficial vessels, which are common in the face, the QuadroStarPROYELLOW is highly suitable. In fact, these special wavelengths are readily absorbed by the hemoglobin of the blood vessels. That means that the light is converted to heat, the blood vessel is damaged and disappears. The water surrounding of the vessel (tissue contains a high percentage of water) doesn’t absorb the yellow light at all, which results in the surrounding skin being spared. 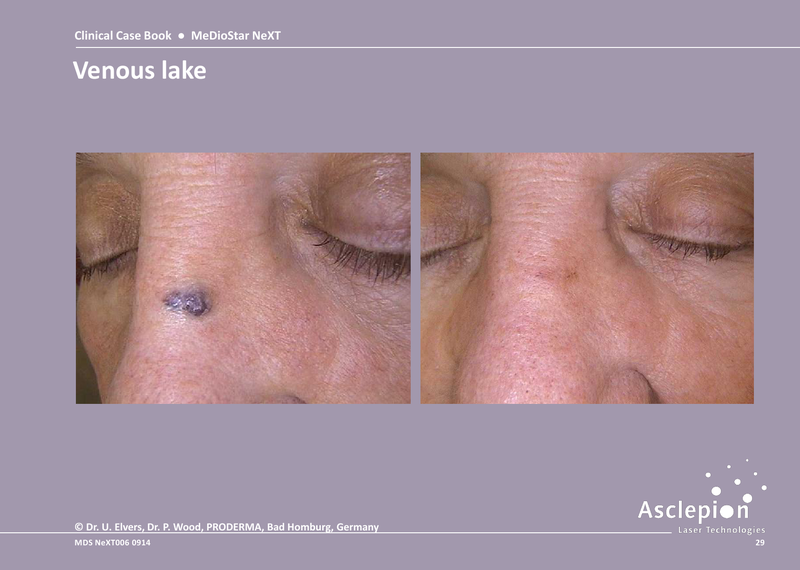 The vessels are ‘erased’ immediately without unattractive purpura (purplish discoloration). 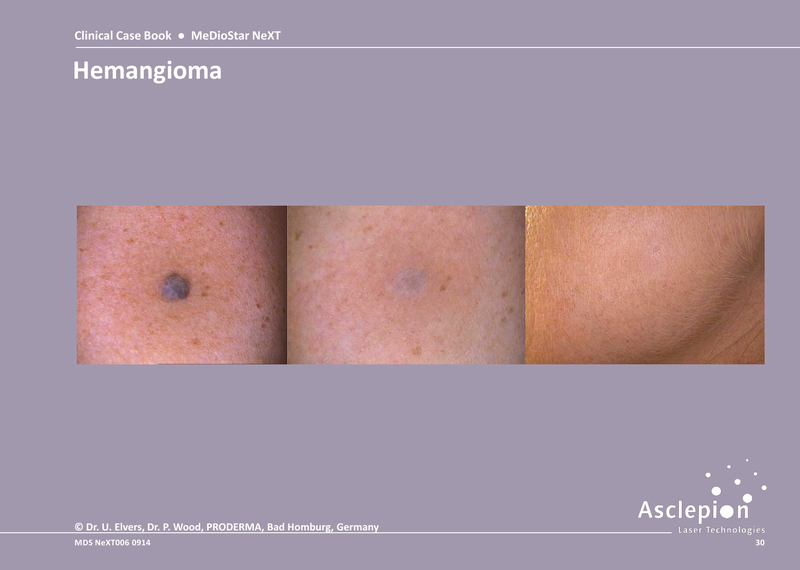 The risk of pigment changes and scarring is also very low. 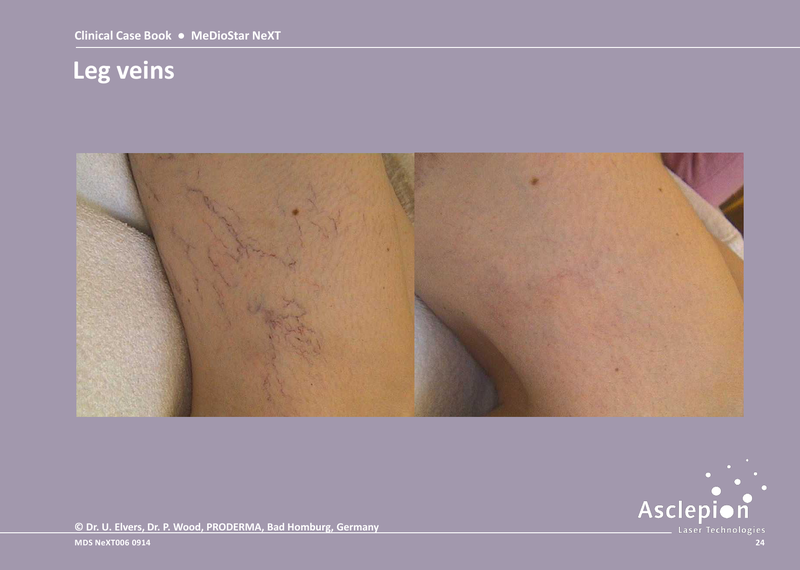 Leg veins remain one of the cosmetic problems where treatment is sought very frequently. For larger ectatic vessels, which are normally deeper in the skin, for example leg veins, the penetration depth of the yellow light is often not sufficient. Therefore, a longer wavelength of light in the near infrared range with sufficiently high power is necessary. 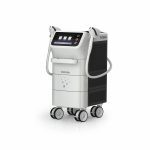 The high-power diode lasers of the MeDioStar NeXT Family feature a special handpiece with a smaller spot, designed specially for the treatment of blood vessels. 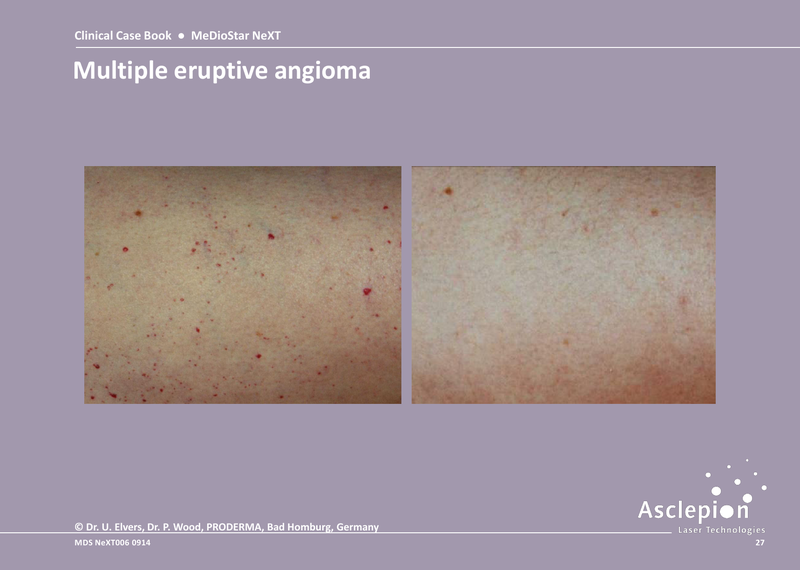 When treating vascular lesions, the light beam goes into the skin and is absorbed by the hemoglobin of the blood. This means that the blood is warmed significantly. This leads to an inflammation of the inner wall of the vessel and thus generates a bonding of the vessels. The result is the occlusion of the vessel, which takes some time depending on the size of the vessel (it takes more time for larger vessels, up to a few months for the deep bluish ones). Each laser beam has a certain color (wavelength). 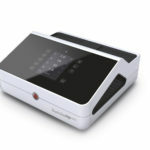 For small ectatic vessels, which are normally red and superficial, the yellow laser beam is particularly suitable, because they are readily absorbed by the blood. On the other hand, the water absorption is very low. Since normal skin consists mainly of water, the bloodless skin remains almost cold and so there is a very minimal risk of damaging the skin surrounding the vessel. For larger and deeper vessels (bluish), the infrared laser beam is more effective because this light penetrates deeper. For larger bluish vessels on the legs (to be treated with infrared laser beams), the skin has to be cooled first. This pre-cooling is not recommended for small red vessels, because they contract under cooling – the blood is gone and so there is no absorption, which means there is no effect. The doctor then scans the affected skin areas with the laser beam. You will feel small pricks, which indicates that the treatment is working. Normally, anesthesia is not necessary. 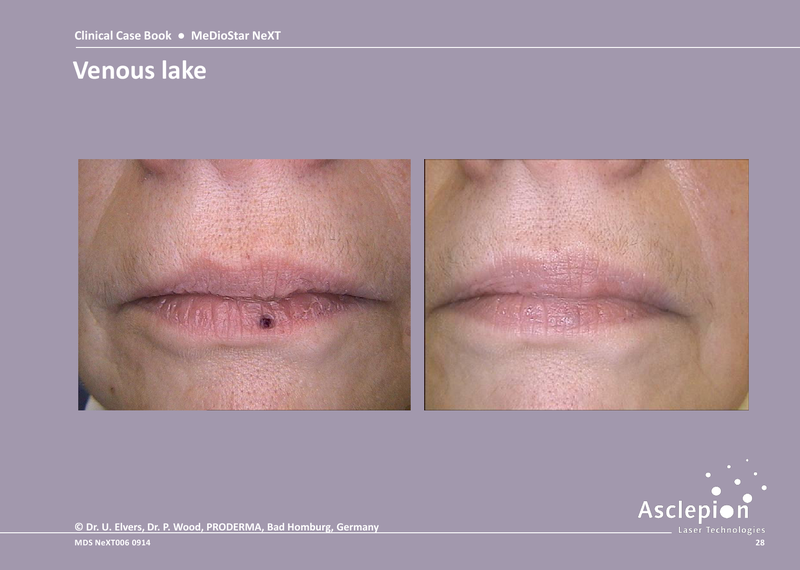 The duration of the treatment depends on the size of the skin lesion; in most cases, it takes only a few minutes. 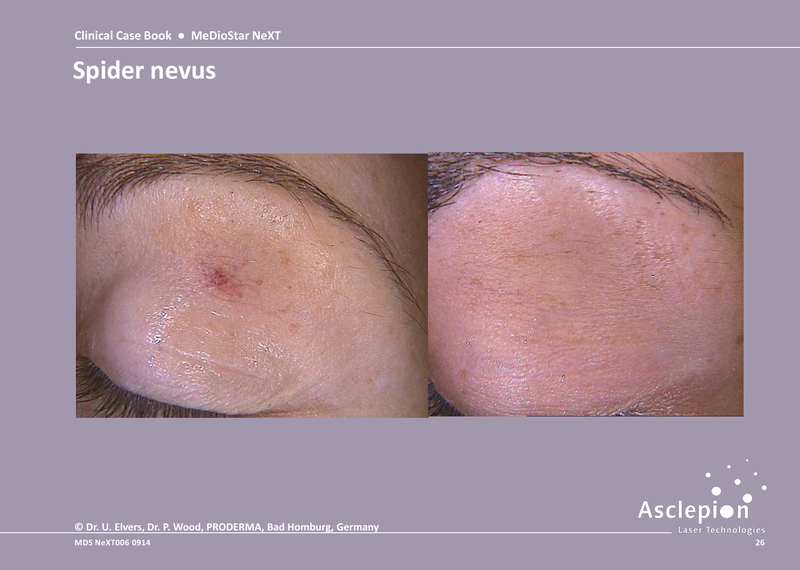 Depending on size of the lesion, redness and swelling may occur following treatment. In some cases, the development of small crusts is possible – these should be left alone. In most cases, you will get the results after a single treatment, which is performed after a thorough examination and consultation by your doctor. The interval for a second or third treatment should be at least six weeks. No medical treatment is completely risk-free. 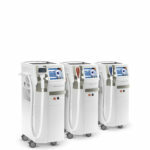 Normally, this laser treatment has minimal complications. 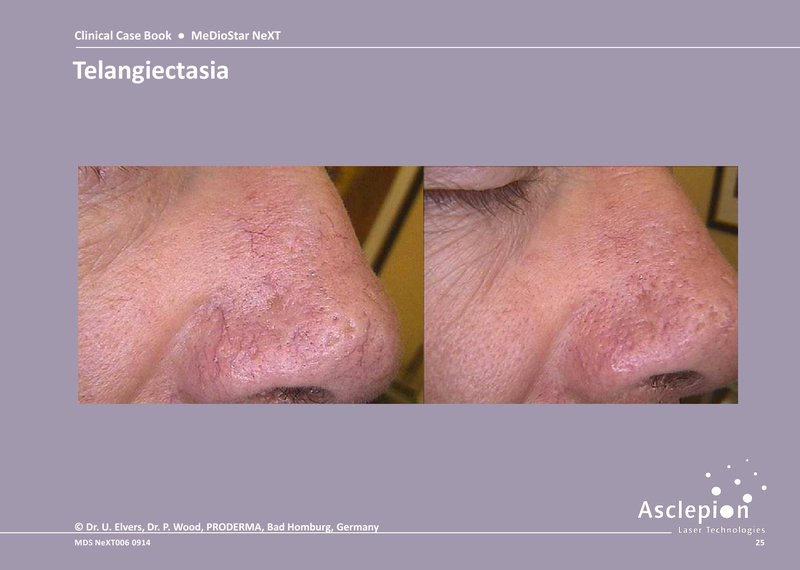 They can include transient pigment changes (light or brown spots) in the treated area, which last for a few weeks or months after the treatment, and the formation of crusts (that normally heal without leaving any scars).